How do I track activities on ClassTag? 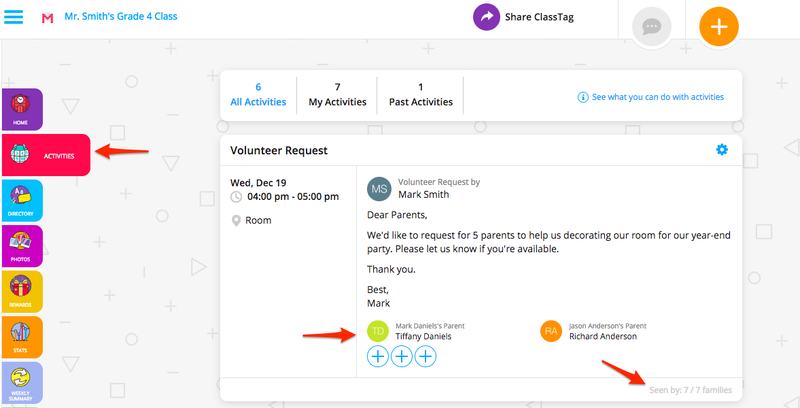 Different sections on ClassTag where you can track the Activities sent to parents. When you create an activity, you need to be able to track the relevant information about that activity easily. ClassTag got you covered. One of the best things about the ClassTag platform is that you always in control and have complete visibility into everything that is going on. We deliver this information when and where you need it in an intuitive format on the Home page, Activities page, and Stats page as well. Our platform collects and analyzes information across different sections in your class and draws your attention to the activities that are not fully and properly addressed by parents yet. 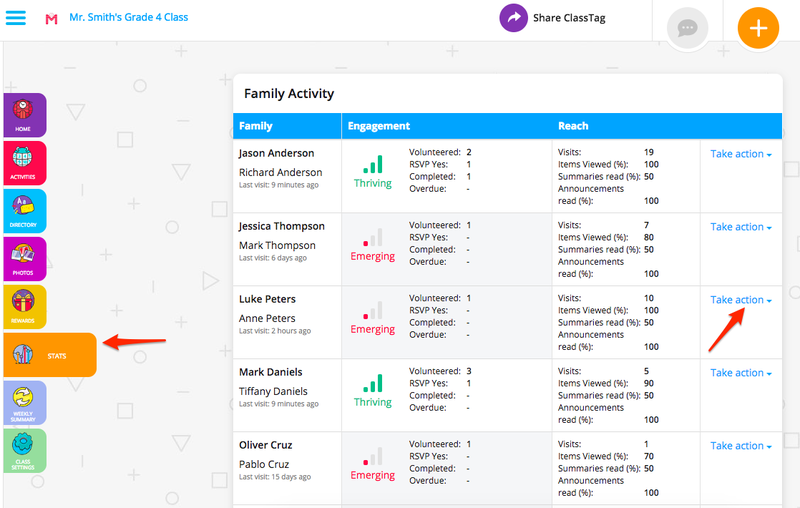 If you announced your activity, you’ll be able to see the number of parents who have already seen your announcement on the Home page. Clicking on the “Seen By” will show you the list of parents who have or have not seen your announcement. On the Activities page, you will see how many parents have RSVP'ed that they are attending the event, how many are attending your Parent-Teacher conference, how many are bringing the items you’ve requested and how many has seen the activity when you announced it. The Activities page is where you can see all the details of each activity in one concise location. You always know what is still needing to be done and what is already under control of your responsible and enthusiastic class parents. To see which families have and have not seen the details of an event, click on the link on the lower left of the Activities item which says how many families have and have not seen the event. To see who has responded to item and volunteer requests for a specific event, click on "Show more" next to any related requests for that event. 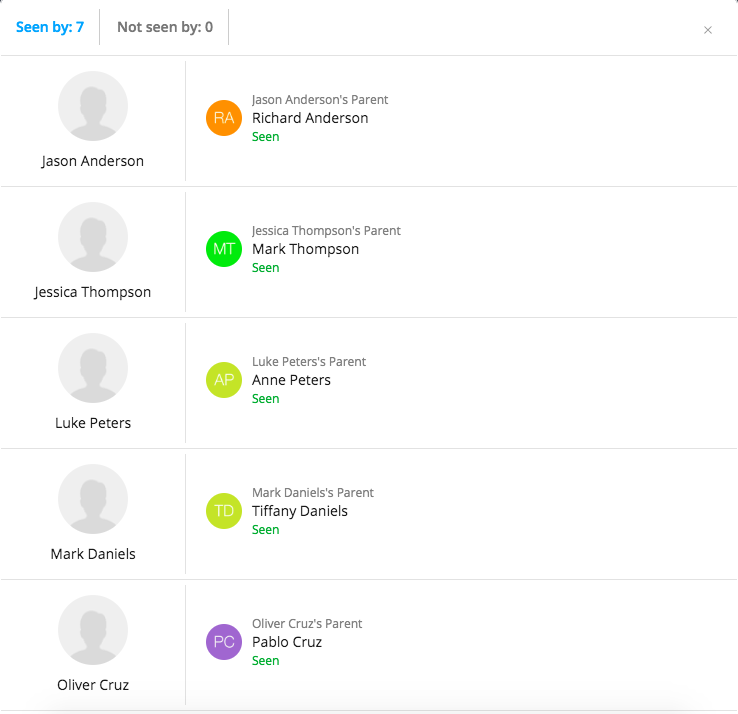 When viewing related requests, you can assign someone to a task by clicking on the plus in the circle for the available slot and selecting "Assign someone else", then selecting the available person from the list of those who haven't signed up. For events with an RSVP, click on the link on the lower left of the Activities item to see a list of who has RSVP'ed. Activities are not limited to the ClassTag platform only. Everyone in the class can sync activities from ClassTag with your other calendars. Add important activities there by clicking "Add to calendar" on the little wheel next to the activity itself and they will appear in your Google account, Apple iCal, or Microsoft Outlook. The Stats page gives you a view at a glance of your parent engagement. Are parents reading what you have to say? Get more volunteers than you need and want to select the ones who actually come? Or want to ensure you invite parents who haven't had a chance yet to volunteer? Check the stats page and find out how many times each family has volunteered. This tab is automatically updated with each activity you and parents take and is good to take a look at regularly to ensure no families are falling behind. 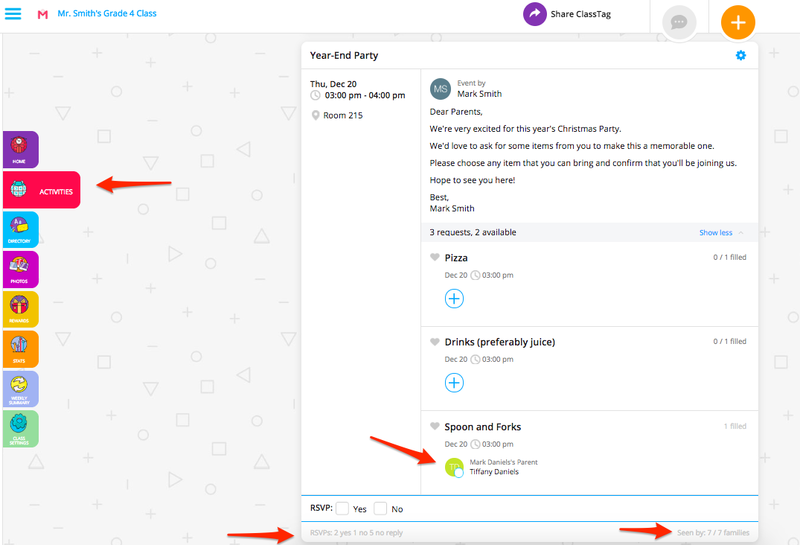 You can also see their RSVP history and should you need to do so, you may click "Take Action" next to the family to email any parent or caregiver. How do I organize activities on ClassTag? Can I assign parents to timeslots or requests?